Crystal Mountain opens for the summer on June 23, with daily Mt. Rainier Gondola rides, Summit House dining, hiking, interpretive walks, disc golf & more. Celebrate the start of summer with a 5K Fun Run! All ages are welcome — and you can even bring your pup along! 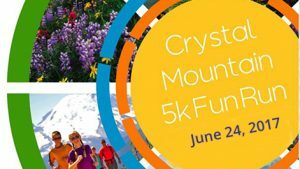 The race is free but donations to the Crystal Mountain Fire Department are welcome. The race starts at 11 a.m. with an awards ceremony afterwards. Come up for the race, but spend the weekend! Summer is happening in Mt. Rainier National Park too and there’s so much to do. And with all sorts of choices for Mt. Rainier lodging at Crystal Mountain, it’s easy to find the lodging that works for you. Learn more and register for the race here.